A modern take on the classic Camilla silhouette, this stunning style features a cinched in waist and flowing ¾ length sleeves. 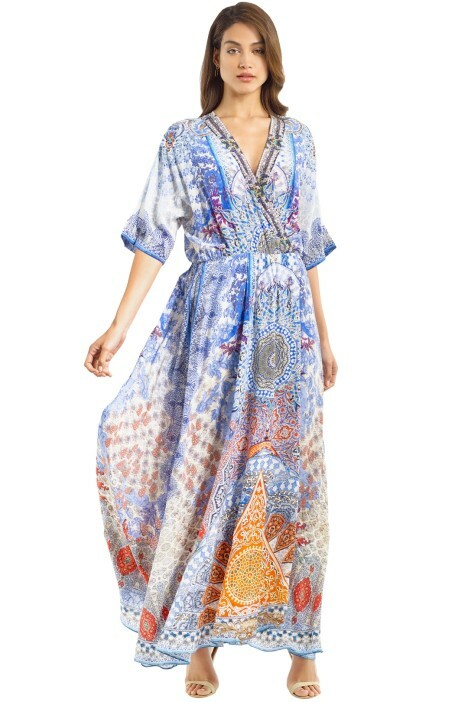 We adore the stunning tribal-inspired print in bold contrasting orange and blue tones! Ultra elegant, this style is perfect to hire for your next beach wedding or formal evening! Style this graceful maxi with simple heels and laid back waves! Wear a pair of beaded drop earrings to complete your look! Read more on our Beach Wedding Style Guide for more styling tips and tricks! Dreams Dress is rated 5.0 out of 5 by 1.